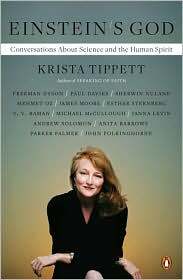 In June of 2009, I reviewed Krista Tippett's Speaking of Faith and offered this criticism: “With all of the rapid motion between topics and ideas, I think Tippett herself was drowned out in the written conversation.” Unfortunately, this criticism was amplified in Tippett's new book, Einstein's God. What could have been a brilliant exposition of Einstein's religious beliefs and how they have grown and manifested throughout history in the science of others turned out to be transcripts of Tippett's public radio show. Tippett's own voice only appeared as introductions to each transcript. It's not that I was disappointed with the content of each interview. All the people Tippett questioned were brilliant, and each had something fresh to offer in showing how religion and science are not mutually exclusive. My worldview has been enhanced by reading what these scientists had to say. Who wouldn't be interested in a former physicist turned Anglican priest discussing the similarities between quantum theory and Jesus Christ's humanity and divinity? I am interested in reading about Krista Tippett the religious thinker, not Krista Tippett the journalist from her radio show. I would like Tippett to take what she has discovered during her interviews and create something new, something beyond a journalist conducting interviews. Her radio show and book introductions show me glimmers of her potential as a religious thinker. I am looking for Tippett's own ideas, not the ideas of the people she interviews (though those are fascinating in their own right). If I wanted to hear the interviews, I would listen to the show, not read them in a book. Banville, Baby, Gimme Some Oomph, Will Ya?